The rig has independent tuning and volume knobs for the 2 meter and the 70 cm bands. The A channel is for 2 meters and the B channel 70 cm. There are 99 memories for each band, or a total of 198 memories. You also get two call channels, one for VHF and another for UHF for a total of 200 memories. You can also set 6 scan edges. Since the IC-2800 has dual VFOs, you can monitor the VHF and UHF bands simultaneously. 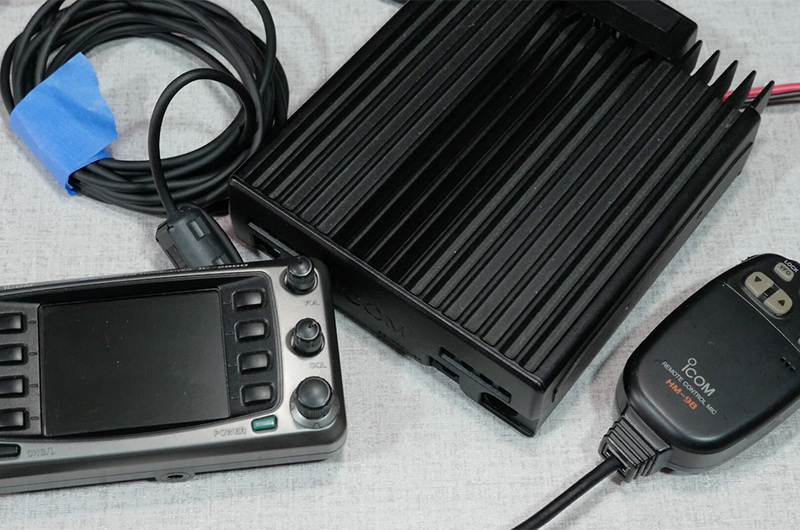 Other features include a packet radio port, four power modes, backlit microphone, crossband repeat, and out of band receive from 118-174 Mhz on VHF. UHF receive is limited to 430-450 Mhz. Now let’s dig into this radio in what makes it unusual. The IC-2800 has a remote mountable head. In fact, this was one of the first radios where remote mounting was the only choice. There is no facility to attach the head to the main body. There had been plenty of removable head radios by this time, but this rig started the trend of the remote mounting only option. Of course If you find this radio on the used market, it may be missing the brackets. Fortunately the screw on the control head is a standard 1/4 inch by 20 screw, so there should be plenty of modern mounting solutions that will work with the head. Since I’m using the radio in the shack, I’ve just got it mounted to a small Joby tripod. Next up, the head itself. it is a full color TFT LCD screen. The colors may look a little garish and the resolution, rough, but this is 1999 technology and the concept itself was pretty new and exciting. By today’s standards the screen is a little dim, but it’s quite easy to read. What I like about the control head is that the speaker is built into it. No external speaker is necessary, your audio is front and center with the control head. Lets dig a bit into the operation of the radio. There are six knobs, three for each band to control the channel, squelch and volume. There are also eight buttons, four on each side to control various activities of the radio. 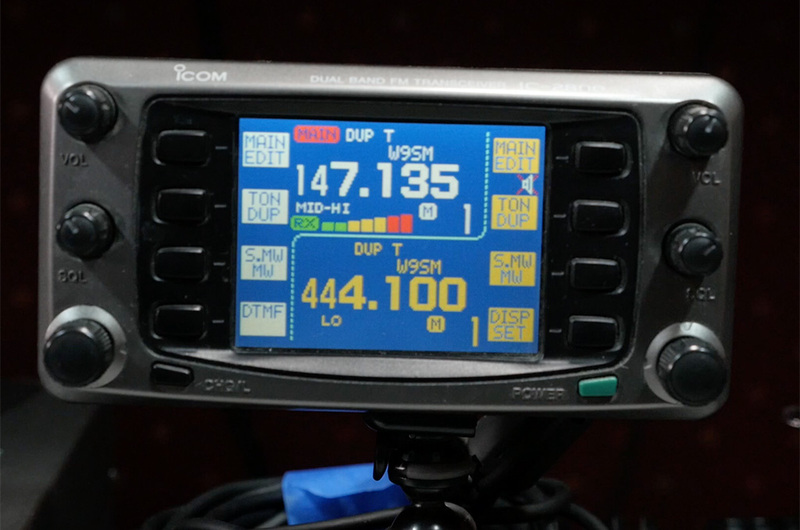 Switching between VHF and UHF is as easy as pressing uppermost button labeled Main. Giving a long press activates the second function of the button. And on the lower right of the radio is a Change/lock button, where you can step through more features of the radio. This makes moving through the menus quick and somewhat intuitive.The power button is in the lower left. Next up, the craziest part of the screen is that it has a composite input. 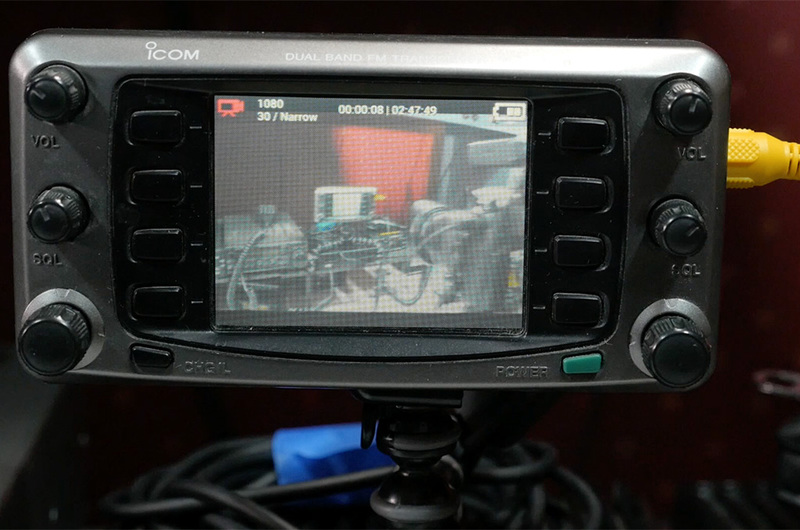 That’s right, you can watch video on your IC-2800 control head. I’m not sure if there was a practical use of the composite input at the time. I suppose you could use it for a backup camera or something, but in 1999 backup cameras weren’t terribly popular yet. maybe you could use it with your ATV receiver. But the the composite input is video only, so you wouldn’t get any audio. It was a gimmicky feature and if any IC-2800 users out there had a use for the composite input, I’d love to hear about it. Of course the IC-2800 has its limitations and there are a couple of downsides to the radio. First off, even though the radio has 99 VHF and 99 UHF channels, the A band is dedicated to only VHF and the B band only UHF. You are unable to monitor 2 VHF or 2 UHF channels at the same time. Having that feature would be nice, as I had a Kenwood TM-V7A from the same era that could do that. The other downside is the Icom microphone. Now the microphone really isn’t that bad. It has the ability to control almost all the features of the radio, you can change power level, band, channel, turn on and off tone and offset. So there is plenty of versatility in the microphone. But it has a chintzy feel and the buttons are quite small. Plus the little cover is one of the first things that you will lose on this radio. Another issue with the microphone is the switch. It’s not the most durable and I’ve seen with long term use, the switch wearing out. So be aware of that if you are shopping for one of these rigs. Lets talk a bit about pricing. When the radio was introduced in 1999, retail price was $670 and it had a street price of about $550. According to the Federal Government’s consumer price index, that would be about $1000 in today’s dollars. Looking on the used market, going price on eBay and the online forums is $250-300, with the median at about $265. I think that’s a tad high and would look for something around $200-$225 at a hamfest. Of course condition will weigh heavy on any price. Look for unscratched screens, clean bodies and all or most of their parts. If the mircophone is rough, you can replace it for about $15 online, so don’t let a dirty or damaged microphone keep you from making an offer on a used unit. Technology has really driven down the costs of new amateur radio gear, so you really need to ask if buying a 20 year old FM rig is worth it. In a sense it is, as this radio still has better receive sensitivity and intermod rejection than a chinese transceiver that uses Direct Conversion technology. If the price is right and the condition is good, I’d recommend picking one up. Do you have any questions about the Icom IC-2800, any memories of this radio? Please leave them in the comments below. I’ll try to answer them and also highlight a few of the best in my monthly question and answer video.